Supports you increasing your physical fitness, your health and personal well-being. 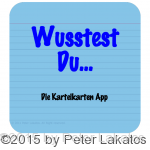 Wusstest Du… App for iPhone – iPad – iPod touch. Cue card games for kids and students! Currency Exchange Converter App for iPhone – iPad – iPod touch. currency converter app! Achromaster App for iPhone – iPad – iPod touch. Tracker app for color blindness!